Then there is the more subtle issue of how the coverage was framed, or the narrative that the journalists build around. Here, tactics and strategy loomed even larger, policy shrunk even further and evaluation of a candidates’ performances grew somewhat. From September 1-December 8, fully 60% of all primary stories were written through a tactical narrative lens. That was more than six times the amount of stories about policy (9%). The national media outlets again stood out for their single-minded coverage. All of the primary campaign stories in both the New York Times and Associated Press followed the tactics and strategy framework. The horse-race frame also was the dominant aspect of Globe and Herald coverage, accounting for more than half of the stories in each paper, albeit slightly more in the Globe (58%) than in the Herald (5%). 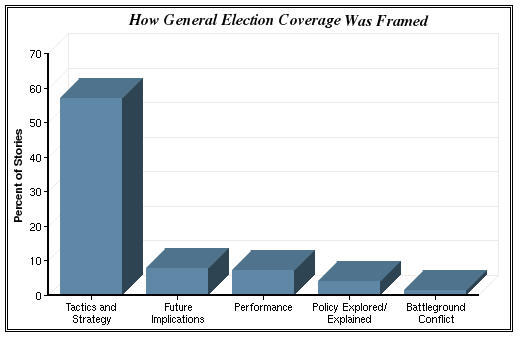 A look at story framing over time also reinforces the finding that the early coverage was dominated by speculation over who would enter the contest. In September, before the field settled, fully 79% of all of the stories produced featured the politics and strategy frame, while the policy frame accounted for about 3% of the stories. Horse race coverage diminished significantly in October (44%) and the first eight days of December (49%) when the performance frame comprised 25% and 26% of the coverage respectively as the media focused on candidate debates. 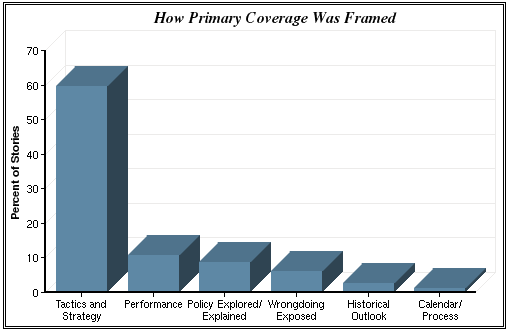 November was the one month when attention to the policy frame exceeded 10% of the coverage. The 17% of overall stories from that perspective in that month reflect the debate over health care reform legislation, which grabbed attention. One other framing finding during the primary suggests this was not a campaign marked by much journalistic vetting of candidates’ claims, either on the stump or in advertisements. The reality check frame, which would cover that kind of aggressive journalism, accounted for 1% of the stories examined. During the two weeks of general election coverage studied, almost the same percentage of stories (57%) were written through a tactical narrative lens as during the primary (60%). The number of stories framed around policy differences actually decreased from January 6-19 compared with the primary campaign (4%, down from 9%). Even though Brown and Coakley had significant disagreements on key issues, most of the news coverage about those differences discussed their impact on the election and was conveyed through a political frame. For example, a January 13 article in the Globe was titled, “Abortion takes stage in Senate race; Candidates air attack ads in final week before special election.” While the topic of the story was the candidates’ position on abortion, the frame of the story was how each candidate was attacking the other’s position in the hopes that it would give them an advantage with voters. There was another significant change in the framing of stories from the primary season to the general election. During the last weeks of the general campaign, there were many more stories framed about the future implications of the election. Almost 8% of the general election stories were framed in that manner, compared with 0.3% during the primaries. Most of these were focused on the impact of the outcome on the Obama administration and the health care reform effort.